Keeping a freezer inventory is vital to getting the most out of your freezer cooking experience. The best use for your freezer and quality assurance for your freezer meals is to use them and replace them often. Overall the contents of your freezer should change about four times a year. This means that you are using the food you buy and the meals you make and getting some value for your hard work. Some things will be kept longer, for example those garden fresh veggies you want to save until the middle of winter or if you buy meat ‘by the side,’ half a cow, pig or lamb at a time, you'll want to keep those items longer. No one likes to find that chicken meal from a year ago or ground beef that is 3 years. But the question is how do you keep track of what is in the freezer and how long it's been there? The best use for your freezer and quality assurance for your freezer meals is to use them and replace them often. A freezer inventory is key, it should be a well organized, simple guide to the contents of your freezer so you know what is in there without even opening the door. Your freezer inventory should include the item that was frozen and the state it is in. Did you freeze hamburger patties raw or cooked? Are they seasoned or just shaped? How much is in each package? 4 raw patties? Half a pound of cooked ground beef with Mexican seasoning? All this information plus the date should be on the outside of the container so you know you are thawing the correct item when you go to use it. You need to know how much of each item you have. I find including the size of the package under item and then recording the number of packages is the easiest way. This section should also include the amount frozen and the amount still in the freezer without extra work. I make a slash for every package I freeze and make that slash into an X when I pull a package out to use. Many people like to include the date an item was frozen and your more than welcome to do that. However, I like to keep my freezer inventory chronologically so that the oldest items are highest on the list. The bonus to a chorological list is that when your making your meal plan you can check the list is see what you need to use and add it to your plan for the week. This helps you keep rotating through the contents of your freezer. Also, not all items can be frozen as long as others and with this method I don’t feel like I need to keep checking dates to see if I have to use something up. As long as you know there are four packages in the freezer and take out the one with the oldest date on the label you’ll be fine. I do like to put the date on the top of the page that way I know which page is most recent and can look back later to see how fast certain meals get eaten so I can make more of them in the future. Getting Started With A Freezer Inventory. You can create your own sheet for this purpose or receive a copy of my printable PDF Freezer Inventory Sheet as a free gift to subscribers of my free Favorite Freezer Foods Ezine, a once a month e-zine about freezer cooking, seasonal produce and foods and new articles designed to help you save time and money with healthy homemade freezer meals. The first time you organize your inventory sheet will be the hardest because you have to figure out what is already in your freezer, how old it is and how many you have. I recommend going one section at a time. I have an upright freezer so I go by shelves, if you have a chest freezer you might need to use baskets or maybe use paper as some sort of mark of where you left off. And believe me you’ll want to take breaks. You’ll get cold digging though your whole freezer. Once your inventory is started update it every time you go shopping and add something to your freezer and every time you cook a new freezer meal. Keep the sheet on a clip board next to your freezer and teach your family to make that X every time they take something out. 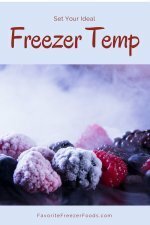 This article is one of a four part series on the basics of freezers cooking. 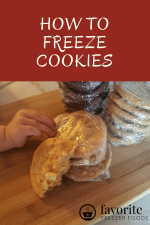 The four articles include what foods can freeze, how to prevent freezer burn, how to thaw frozen food and keeping a freezer inventory. Return from Freezer Inventory to the homepage of Favorite Freezer Foods.